Here's another mixed six-pack of beer reviews in one post. Before I tasted Ballast Point's Fathom IPL (an India Pale Lager), I wondered how it would compare to Sierra Nevada's Hoppy Lager. Well, Fathom is really good, but no where near as good as Hoppy Lager, and it makes me realize what an accomplishment that Sierra Nevada Beer Camp offering really was. Hoppy Lager is very much a lager. In contrast, I don’t know if I’d have guessed that this was a lager if you’d served it to me blind. The hops are huge and up front in the aroma and flavor, the lager yeast that shows up on the tongue is very reserved. This beer pours a clear, golden color with a lot of suds. The aroma is slightly sweet, but mostly grassy/pine hops. That’s the flavor, too, but if you know to reach for it, you might pick up on a sweet, caramel lager character. Not bad, but not the best thing I’ve had from the brewery... and not as good as Hoppy Lager at all. Great Divide's Oatmeal version of Yeti Imperial Stout doesn't have a pronounced oatmeal character. The best oatmeal stouts are dense, chewy. This one doesn't quite have that exact oatmeal stout thing going on. I don’t taste a tremendous amount of difference between any of the different variations of Great Divide’s Yeti Imperial Stouts. But I’ve really enjoyed all of them, so I’m not complaining. Oatmeal Yeti might be a little less sweet than the Chocolate and Espresso variations of this stout, but it’s just as rich and seems to have just as much dark chocolate presence. It pours jet black with a thin, brown head. The aroma is coffee and malt and hops. That strong, typically Yeti bitter, dark chocolate is there in the flavor. The vapor on the finish plays the 9.5% ABV card pretty clearly. Left Coast's Voo Doo American Stout isn't bad. It might be little light, as stouts go, but it's still pretty good. It pours very deep brown with average head. The aroma is coffee and plenty of hops. I've noticed that "American" on a beer label just means that it's hopped all to hell. I'm fine with that. This thing still has some malt character in the flavor, though, and some chocolate. It's a decent little beer. I don't always like the lighter beer styles; pilsner is entirely lost on me, and I'm often stumped about what I'm supposed to get out of a saison. But I do have a taste for good hefeweizen, and Flying Dog's Hefeweizen is not a good one. It's bland. It pours cloudy yellow, the head is thin. The aroma is malty but a little medicinal. The flavor is a little like a dry white wine up front; slightly fruity, but without much to comment on one way or another in the finish. It just isn’t much of a beer. Parkways's The Remedy Brown Ale is ok. It pours a clear brown, average head. 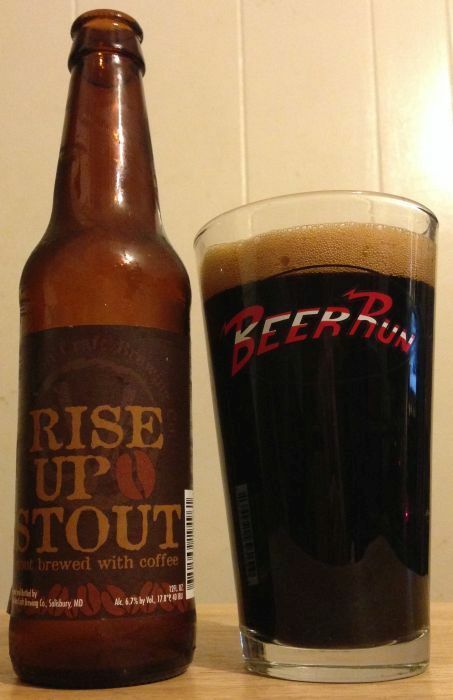 The aroma is slightly sweet and malty, and so is the flavor. There is a mild molasses, apple butter quality in the background. Not one I'll have again. Very average. Maybe coffee stout has just been done to death, but for one to impress me these days it has to be really very good. 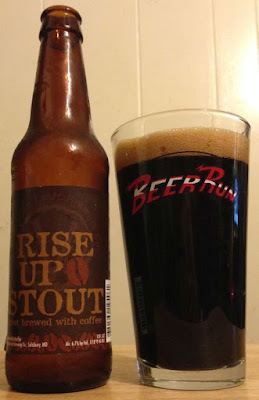 Evolution's Rise Up Stout is not really very good. It pours dark brown, the head is average, the aroma is maybe a little burnt. There's something slightly off. The flavor is a little better; that burnt quality doesn't transfer to the tongue. After each sip I said "eh." Life is to short for very many glasses of "eh."